The remains of former UN Secretary General Kofi Annan arrived in Ghana from Switzerland. The body of the late Secretary General is being accompanied by his wife, Nane Maria, children and some UN officials. The government of the West African nation and the family of the late Diplomat are ready to elaborate funeral rites that will precede the burial on Thursday. Kofi Annan, the soft-spoken diplomat from Ghana who became the seventh secretary general of the United Nations, projecting himself and his organization as the world’s conscience and moral arbiter, died on August 18, 2018, in Bern, Switzerland. The Nobel Laureate was reported to have fallen sick on his return trip from South Africa after he had attended the centenary celebration of the birth anniversary of the South African icon, Nelson Mandela. He was 80. According to local media, Kofi Annan will be accorded a state burial and his body interred at the new Military Cemetery of Ghana on September 13, 2018, after burial service at the Accra International Conference Centre (AICC). Dignitaries, including chiefs, Members of Parliament, cabinet members and members of the diplomatic corps would file past the body on Wednesday, September 12, 2018. As a reminder, Kofi Annan was the first black African to head the United Nations, doing so for two successive five-year terms beginning in 1997. 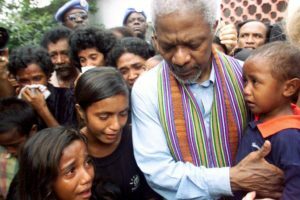 Kofi Annan was credited with revitalizing the United Nations’ institutions, shaping what he called a new “norm of humanitarian intervention,” particularly in places where there was no peace. Posted by Emmanuel Agbenonwossi on September 11, 2018. Filed under News, Zoom. You can follow any responses to this entry through the RSS 2.0. Both comments and pings are currently closed.